From “Famous Places in the Eastern Capital (Edo)”. Breaking with earlier depictions of night-time activity on the Ryōgoku Bridge, Hiroshige turns his attention here to the construction of the bridge and the river landscape behind it. The capital city of Edo already appears to be in deep sleep. This print is framed by a separately printed decorative border, which was alternated within the same edition (cf. cat.196). The woodblock print, which became famous in the West, is also said to have inspired Whistler. In the west this is perhaps one of the most famous and influential of all Japanese prints since it inspired Whistler in his view of Battersea Bridge. One tends to think of Hiroshige as a steady, dignified, rather elderly gentleman, as he appears in his memorial portrait. But here, at the beginning of his career, just turned thirty, we must appreciate the vigour of his imagination as well as the tranquility of his effects. Most artists of the generation preceding Hiroshige had designed prints of Ryōgoku, but invariably they focused their attention on the lively bustle, the crowds of pleasure seekers, and the pleasure boats themselves that plied their way to and fro along the river. 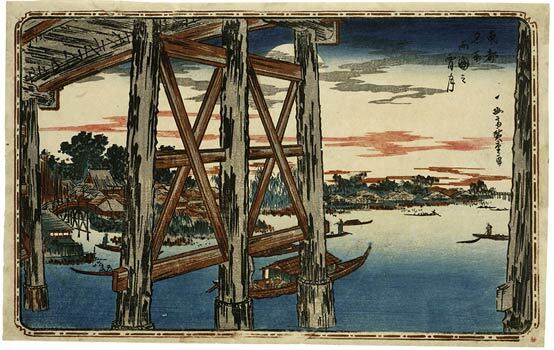 Breaking from these restraints entirely, Hiroshige focuses his attention upon the pilings of the bridge, surely the first person to do that, and then, beyond, bathed in moonlight, shows a few small craft resting quietly on the waves, with the darkened houses of a sleeping city on the bank behind.